France in London | Emilie Simon's new album: "The Big Machine"
Emilie Simon's new album: "The Big Machine"
Emilie Simon's fourth album, The Big Machine, is the glorious sound of New York as seen through the eyes of French sonic auteur Emilie Simon. After living there for two years, Emilie has recorded her tribute to the city: a Dreamland with its many faces cast as a Rainbow. Almost entirely sung in English, The Big Machine acknowledges that Emilie is an artist who recognises no borders. Recording in New York for the first time, rather than her home studio in Paris, Emilie has furthered her boundaries by collaborating with musicians like Kelly Pratt and Jeremy Gara of Arcade Fire for The Big Machine. In France she has been a multiple award winner since 2004. Her soundtrack for La Marche de l'Empereur - the original version of March Of The Penguins - was nominated for a César, the French equivalent of an Oscar. Now, from her adopted American base, the secret is out. New York has discovered Emilie, with her intimate shows there attracting the attention of The New Yorker. The New York Post placed The Big Machine's Rainbow in the top thirty of its top songs of 2009. Vogue has noticed Emilie too, calling her "extremely stylish." Blender magazine said she was "shamelessly chic." boundaries Emilie evolved a new way of playing live - with "the arm". Developed by Cyrille Brissot of IRCAM for Emilie, the arm encases Emilie's left arm and enables her to trigger and play instruments live - she no longer needs to beat at an instrument to play it. Live, she would become a hybrid herself: part instrument, part performer. In a sneak preview review of the French release, MOJO magazine said The Big Machine has "a lustrous popiness. Vocals swoop like a supple, perky Kate Bush, Rainbow moves with the sure-footedness of Rihanna, the sinuous electro pulse of the single Dreamland is captivating and no melody is less than memorable." The British release of The Big Machine means that we will soon agree with what America is beginning to discover. Emilie Simon is no longer for France alone. Emilie Simon was born in Montpelier, in the south of France and was surrounded by music when she was growing up. She used to accompany her sound engineer father to recording studios and live jazz shows, while studying music at the local conservatoire but she found her musical voice after studying in Paris. Moving there, she studied medieval music and contemporary electronic music at the Sorbonne, which led her to IRCAM - the Conservatoire et l'Institut de Recherche et Coordination Acoustique/Musique - the institution founded and directed by the French composer Pierre Boulez. Four years later, she had gained a masters degree in musicology. Equally at home with English and French, Emilie looked to her fondness for pop and dance music and decided that, instead of a career in experimental music, she would find her way in the mainstream. Her debut album, 2003's self-titled Emilie Simon, was an instant success, winning her a prestigious Victoires de la Musique in 2004 award for best electronic album. France had fallen under her spell. Her debut album's unique approach was best illustrated by the cover version of The Stooges' I Wanna Be Your Dog, which Emilie recast as melodic, yet introspective, electronica. By the end of 2003, her debut album was so popular that it was reissued with a newly-recorded English-language version of the song Désert. 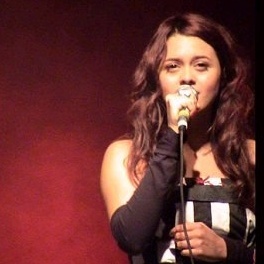 In 2007, Emilie Simon was still in the French album charts. Emilie's international outlook was underlined by the album being mixed by Markus Dravs, who had worked with that other unique female artist Bjork. France began to realise that it was the home to a talent as strong as Bjork. Her next album, 2006's Végétal, was another landmark. Britain's MOJO magazine described it as a "beguilingly mysterious sound world.". The story of a half-girl, half-flower named Alicia, Végétal was filmic in scope with electronics blending seamlessly with orchestral instruments, but it was intimate too. By this time Emilie played live with orchestras and was recognising no musical boundaries. She had a home studio in Paris and was evolving a new way of playing live, with "the arm". Developed by Cyrille Brissot of IRCAM for Emilie, the arm encases Emilie's left arm and enables her to trigger and play instruments live - she no longer needs to beat at an instrument to play it. Live, she would become a hybrid herself: part instrument, part performer. Needless to say, Végétal was another smash in France, picking up 2007's Victoires de la Musique for best electronic album. Established in France, and despite the March Of The Penguins sleight, Emilie was picking up attention in America. The US label Milan Records issued a compilation of her works to date, entitled The Flower Book, in late 2006. And, in time, it was America that would be calling to Emilie. Her first US dates were complemented by shows in the Philippines, Hong Kong, Canada, Iceland and Poland as well as a tough schedule in France. Somehow she managed to also compose the soundtrack for Vera Belmont's film Survivre Avec Les Loups, the harrowing story of a young Jewish girl from Belgium during the WWII Holocaust years. The touring after Végétal was followed by a late 2007 break in New York. Emilie fell in love with the city and is now resident in Brooklyn. The relocation gave her the opportunity to make things more intimate again, not to have to play to audiences expecting the multiple award winner. A residence at the New York club The Cutting Room gave Emilie the opportunity to showcase newly-composed songs as works in progress and develop them in front of a small audience. This new approach laid the ground for her new album The Big Machine, the title of which is Emilie's comment on New York. Featuring musicians like Kelly Pratt and Jeremy Gara of Arcade Fire, and John Natchez of Beirut, Emilie has used her relocation to draw on the organic once more. Recorded in a New York studio, rather than her home, there are co-writers too but The Big Machine's keyboards, programming, arrangements and production are Emilie's. From the beginning, Emilie has always looked beyond France. The Big Machine is the culmination of that journey. I have recently had the pleasure in listening to the new album,"Frankie Knight" and I like it.I also like her other albums Vegetal and Ballad of the Big Machine. 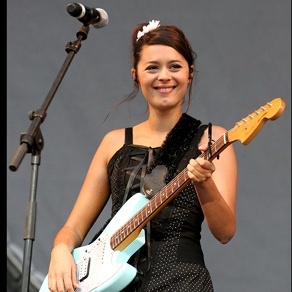 I love Emilie Simon she is such a lovely beautiful woman and a fantastic musical artist, she deserves more recognition especially in the UK. I look forward to future albums by the lovely Emilie Simon. Emilie is my favourite musician by a wide margin. So inspirational and versatile, whilst remaining charming and focussed.